AWI ‘s eSpeci has hit the sheds as the first phase of WoolQ. Despite recent criticism of the initiative’s cost benefit, value and duplication of other eSpecis being developed by AWEX and AWH, AWI said WoolQ has been created after three years of consultation and discussion in response to industry demand for a centralised digital information platform. The portal concept was initially suggested to an AWI-commissioned Wool Selling Systems Review panel, set up to investigate efficiencies and cost-savings in wool marketing. The Wool Exchange Portal was promoted by AWI as a tool for growers to make meaningful comparisons of wool marketing options, promoting transparency, choice and competitiveness. However, despite concern and opposition from broker, exporter and grower groups, and disagreement with AWEX over data and ownership, AWI continued to develop the WEP or WoolQ’s potential functions. AWI is now promoting WoolQ as a virtual headquarters for the industry, enabling the capture of information and access to data, selling and trading opportunities. AWI said WoolQ, formerly known as the Wool Exchange Portal, would facilitate online collaboration between wool grower, classer, broker and buyer, and the digitalisation of the process, allowing a wide range of information to be accessed anytime and anywhere via desktop or mobile app. This increased transparency and traceability is a feature increasingly sought by growers, consumers, manufacturers, retailers and brands, the wool research development and marketing body said in a statement today. 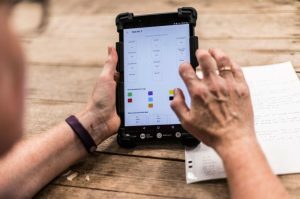 AWI said the WoolQ eSpeci tool is an alternative to the current paper speci and allowed wool growers and wool classers to accurately and efficiently capture their in-shed clip data at the time of shearing. By recording this data electronically, AWI said the eSpeci would reduce errors, enable easier sharing of documentation and a central source of information from multiple users. Where no Wi-Fi or internet connection exists, the WoolQ app would allow users to access, record and store critical information to be uploaded automatically when internet connection is available, AWI said. Once the eSpeci is complete, it can be sent electronically to the broker or shared with any other contact for visibility, traceability and collaboration. AWI said the eSpeci has been trialled successfully across multiple working shearing sheds in New South Wales and Victoria. Cavan Station property manager Matt Crozier at Yass said he trialled the WoolQ eSpeci during February and could see clear efficiencies for shed operations and communication to brokers during shearing time. Victorian master wool classer Raelene Laidlaw she loved how the eSpeci kept things organised and helped prevent manual errors. “Digitising the paper speci is a really good thing not just for current wool classers but also for the next generation,” she said. Western Australian wool grower Neil Jackson said the WoolQ eSpeci is really easy to use. Connect with the wool industry. AWI’s chief executive officer Stuart McCullough said WoolQ is a significant development for the wool industry that he is “very excited” about. AWI said WoolQ could be accessed by any member of the wool industry, including wool growers, classers, brokers, buyers and industry associations. Users first need to register at www.woolq.com and will then be prompted to set up a profile. WoolQ project director Peita Piper said the portal’s approach is to release the various pieces of WoolQ functionality as they are developed. To support users as they learn to adopt WoolQ, a customer assistance service is operating at info@woolq.com, or 1800 070 099 and easy-to-follow video tutorials and user guides are also available on www.woolq.com. For more information on WoolQ, visit www.woolq.com or click this link to see a short overview video.